NOTE - I need to update this narative based on new information recieved from Martin Schneider on Jan 19, 2014, who lives in Germany in the town where my ancestors were born and lived - and who knows of and has researched the Zentz family. 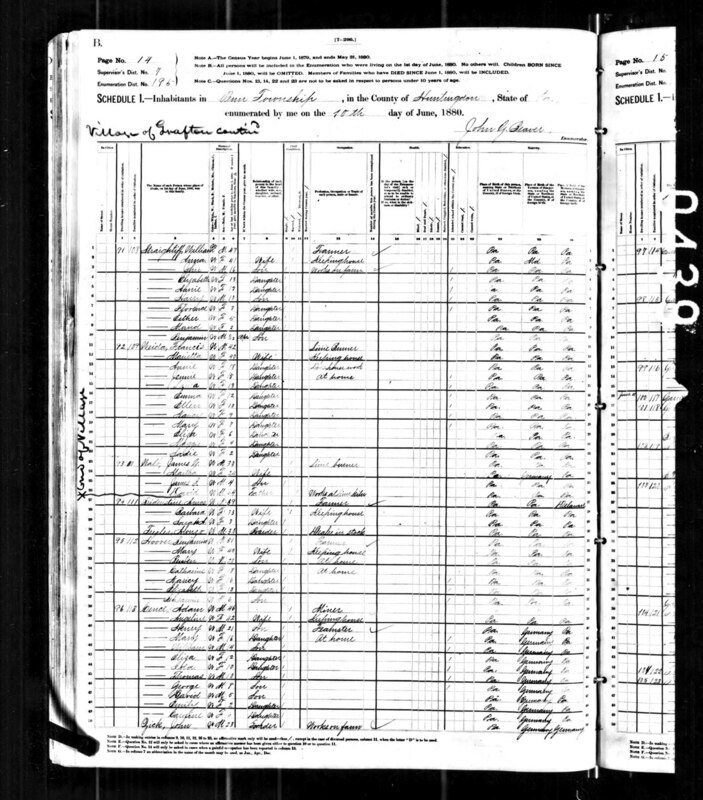 My earliest known ancestor is believed to be Jacob ZENTZ (my great-great grandfather), who is believed to have immigrated to the USA in 1838 from Germany with his wife, Elizabeth, five sons and two daughters. My father, John Tyson Sents, told me: "his father's father came from Germany and was one of seven boys(kids?)". A third daughter, Caroline, is believed to have been born at sea enroute to Philadelphia (possibly) in 1838. Their port of entry and immigration date have not been found in any ship passenger records, so not verified yet. 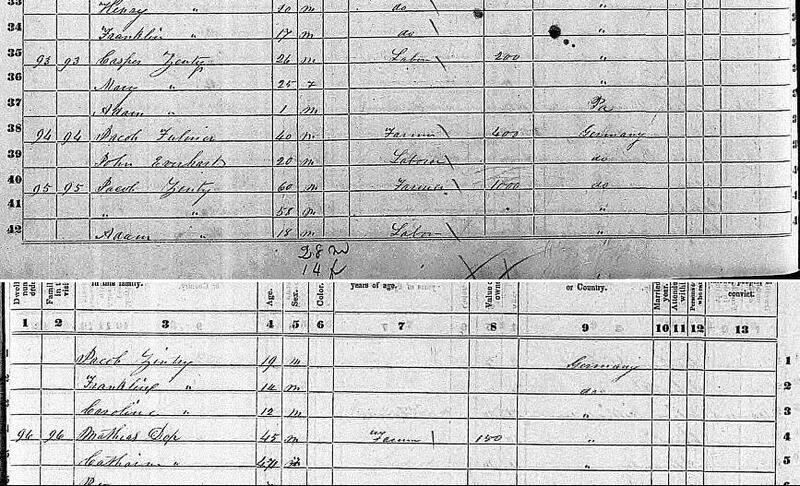 I originally believed they arrived here about 1830 - based Joseph ZENTZ's Letter, which says, Casper "Came to USA at age 6" and the fact that Casper was 26 in the 1850 Census. 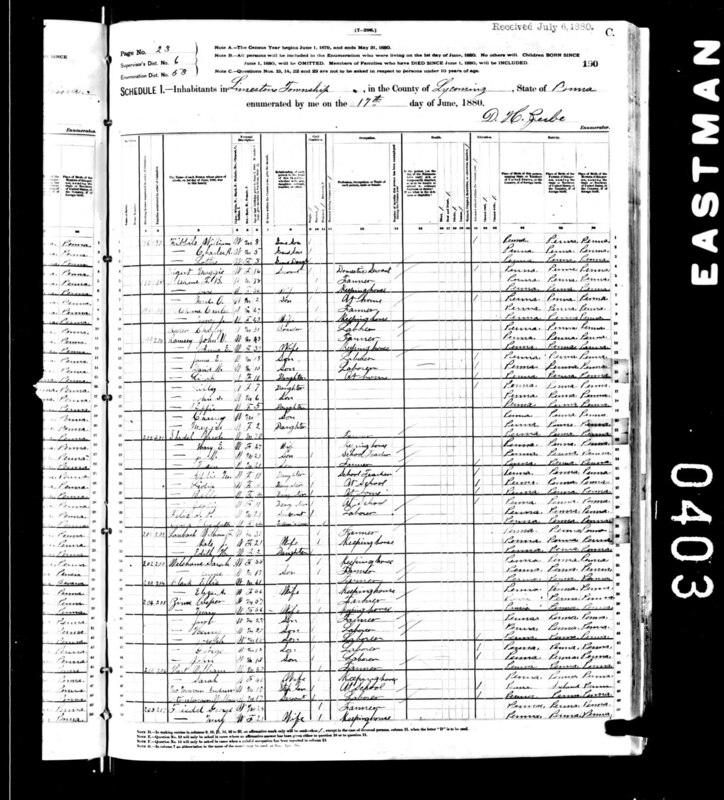 However, 1930 must be incorrect because - Franklin CENSE, was born in Germany in 1835. Jacob, who was a miner by trade, and his family originally settled in the coal mining area of Pottsville, Pennsylvania. 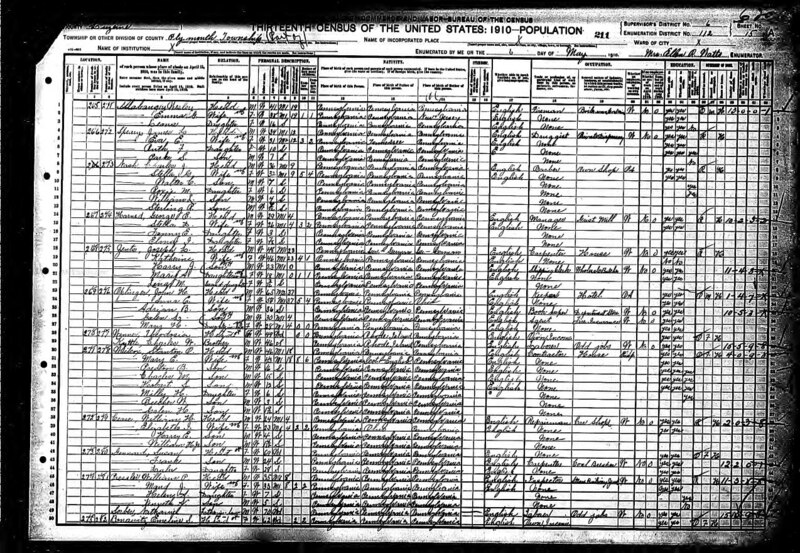 They are listed under 'Jacob Zens' in the 1840 Census for Branch Township in Schuylkill County, PA. Jacon and Elizabeth's two oldest sons, Conrad and Casper (my great grandfather), are believed to have been married there. By 1850, the family had migrated to the Nippenose Valley area of Pennsylvania to the Limestone Township of Lycoming County according to the 1850 Census - where, Jacob 50 and Elizabeth 48 are listed with four sons: Casper ZENTZ 26, Jacob [Jr] ZINTZ 19, Adam ZINTZ 18 and Franklin ZINTZ 14; and a daughter, Caroline ZINTZ 12. Conrad and his family remained behind in the Pottsville area (Blythe Twp.) according to the 1850 Census, where his name is listed as 'CINCE'. 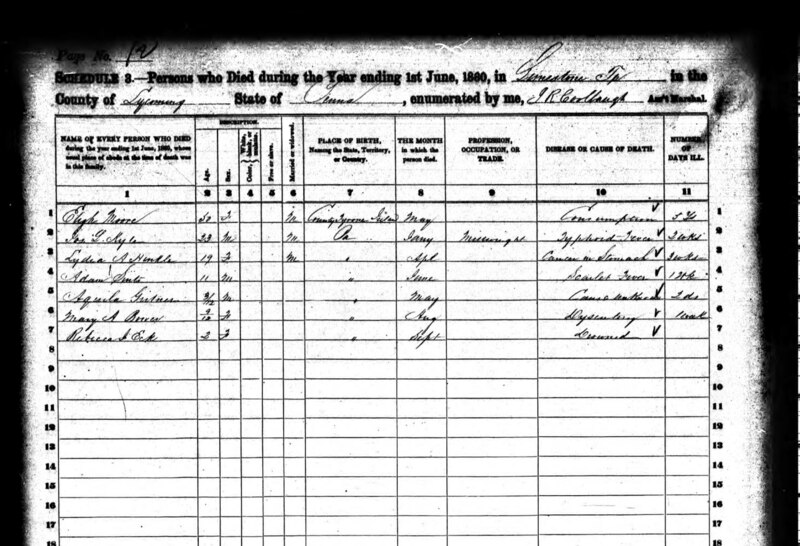 In the 1860 Census, Jacob 60 and Elizabeth 61(?) both listed Prussia as their place of birth. Interestingly, the surnames are all spelled, CINCE. Their son Casper 37 is listed as a neighbor along with his wife Mary 36, and five children: Charles W. 9, Jacob [J] 7/8, Peter 4/5, Casper [R] 2 and Henry [T] 3 months old. 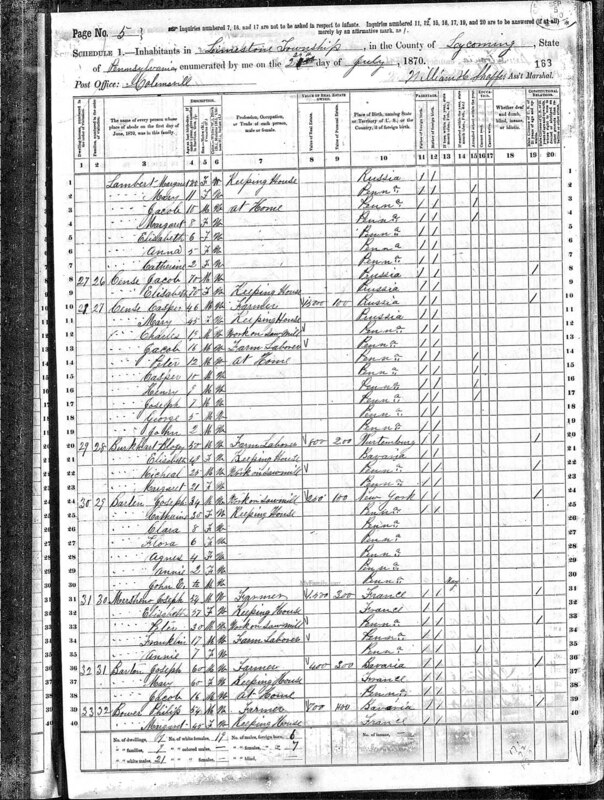 Adam is not listed because he died in June at age 11 from scarlet fever (apparently just before the census was taken). Their son Adam 27 and his wife Angeline 22 and new son Henry J. 8mos. are living in Nippenose Twp. Adam's birthplace is given as Germany along with his occupation as Miner. Their children: Jacob Jr., Franklin and Caroline are missing. In 1870, Jacob 70 and Elisabeth 70 are still living. Casper has three more sons: Joseph (L) 7, George 5 and John (F) 2 (John Franklin, my grandfather). Casper's brother, Franklin 34 "from Prussia", is now married to Christina 30/35, from PA, and they have a son Edward 1. Interestingly, the surnames now are all spelled, CENSE. 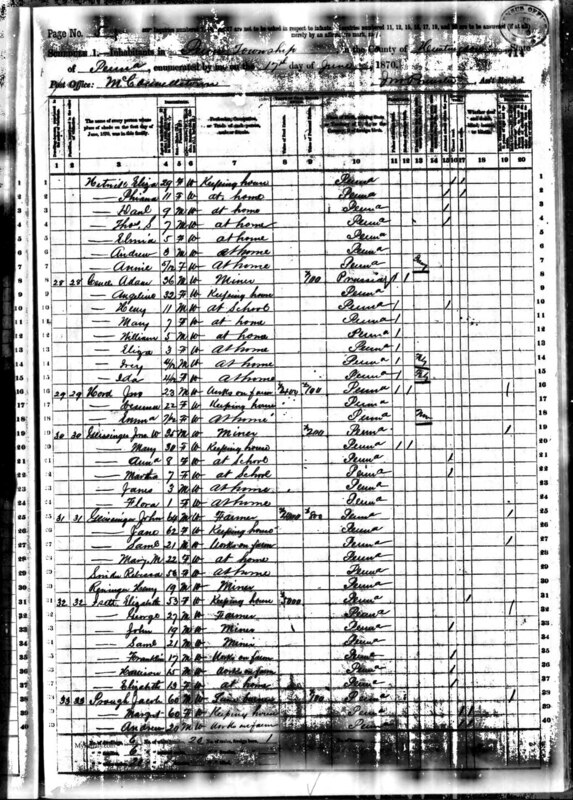 In the 1880 Census, the elder Jacob and Elizabeth are missing (they may have died - and where they are burried is unknown). Casper 57 and Mary 56, now listed as ZINCE, and still living with them are their sons Jacob (J) 28, Henry (T) 20, Joseph (L) 18, George 15 and John (F) 13. Charles W. 29 and Casper R. 20 have apparently left the area. Peter SENTZ 24 is living with a different family in the area, working as a servant farmer (a further reference to him has not been found). Casper's brother Frank[lin] ZINTZ 45 and Crista [Christina] 40 now have two more sons: William 9 and George 3, in addition to Edward, now 11. In 1889-1892, Casper R. SENTS, Henry T. SENTS, Joseph L. SENTS and Jacob J. SENTS are known to have lived and worked at various times in Williamsport, PA according to the City Directories. In Abt 1930, my mother recalls meeting my Dad's "Uncle Casper" (but I think it was his cousin, Casper J.) in downtown Newberry, PA. In the above senario the surnames, ages and birth places do not all jibe completely between Census years but I believed they are just natural inaccuracies that might be expected of people remembering/relating facts, recording errors that might be expected of a Census taker, and ambiguity in interpreting the hand-written data. There is just too much that does jibe in terms of Names, Places, Ages and in continuity, especially for such a small and remote geographic area, for it to be just a coincidence! 1934 letter to my Aunt Ella Sents (Father's sister) from Joseph Zentz, 20 Locust St, Nanticoke, PA.
c.  Casper ? Zentz (est 1830 - est 1905) "Came to USA at age 6. He died at age 75"
her family to come to USA. 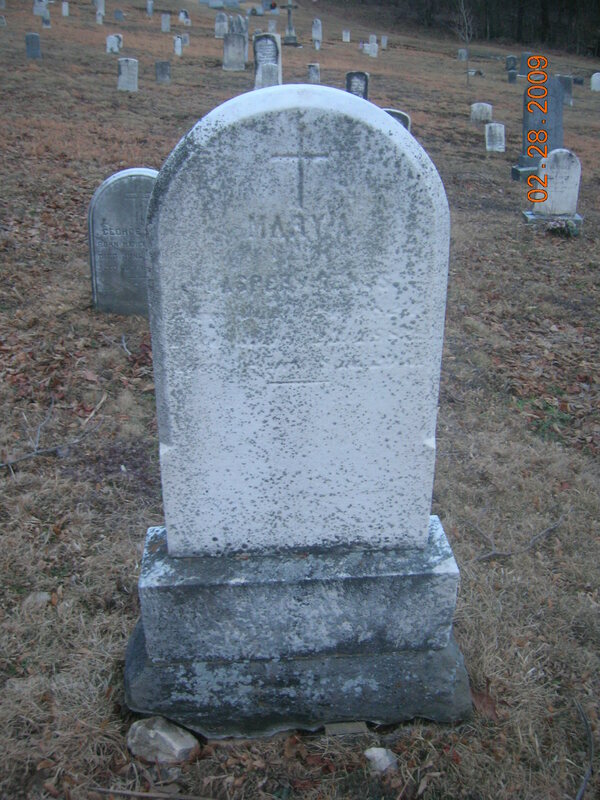 She died Mar 26, 1883, 51y, 10m, 22d old". c.  Joseph [L.]? 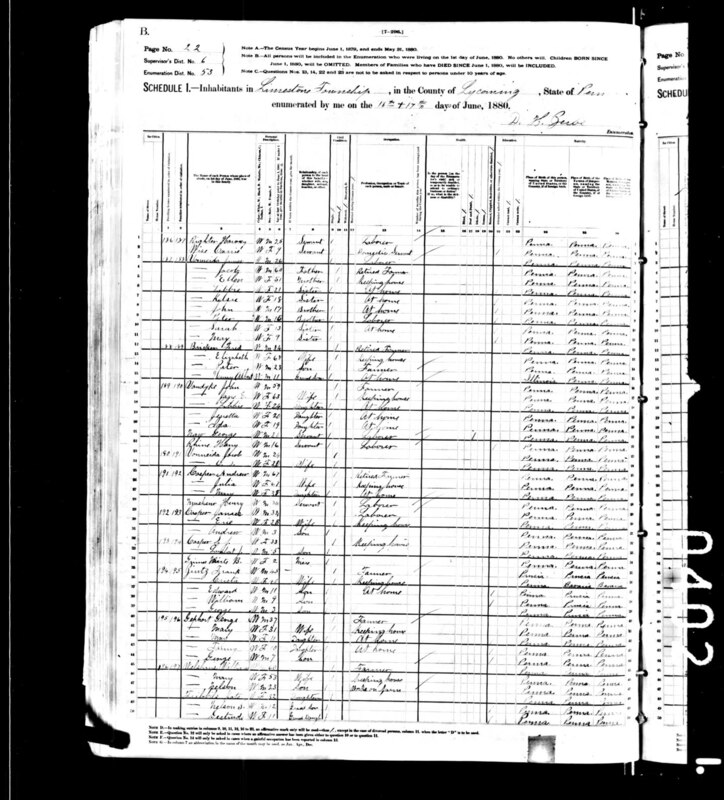 Zentz  ( - aft 23 Jan 1934) Nanticoke, PA. "My father's name was Casper"
b. Jul 31, 1899 d. May, 1971 who lived in Washington Mills, Oneida, NY 13479. Looks like he also had a son Casper B. (from SS data). m.  ___? ? Earon? (Found this connection??? on internet Obit. piece). c. Jennie Sents   "Jennie Louder - lives at 600 College Ave, State College, PA" (in '34). She is a descendant of George Washington Sentz/Sents, brother of John F. Sents (my grandfather). can prove conclusively that it is Casper Sents/Zentz!
? [Betty?] 10-15   F   |  Catharina      * 22.02.1825 Me.
? [Adam]             5-10   M   |  Johann Adam    * 27.11.1832 Me. |  Peter SEHN  Elisabeth's Father ??? 2 daughters and Elisabeth's father. 36  Mary [A]      "       25       F                   "
41  [Elizabeth?] "       58(48)? M?                  " 42  Adam          "       18       M   Laborer         "
2  Frankline?    " 14       M                   PA? 3  Caroline      "       12       M? 17/38  Jacob ? Cince     60   Farmer        Prussia   * cannot read & write! 17/40  Caspar ? Cince     37   Farmer        Germany   * cannot read & write! * (only 10?) was 2 in 1860??? 20/39  Jacob [J]*  Cense     17   Farm Laborer  PA           USA? USA? * This may be a duplicate count, ie, included above by mistake. He may have really left home to work. 23/38  Casper      Zince     57   Farmer        Prussia      PA?? PA?? 39  Mary                  56                 Prussia      PA?? PA?? 14/38  Adam     Cence        46   Miner           PA? PA?? PA?? Angeline              42                   PA           PA?? PA?? Jacob    Zentz        80  must have died? Elizabeth             80  must have died? 17/11  John F Sents       42  12 yrs     Sawyer      PA     PA? PA? 42/82  Peter Sents        45  23 Yrs   Teamster@SawMill PA     PA? PA? 36/65  [G] Ruth  Sents    11  pupil        WV? WV? WV? who married Jacob's brother, Casper [R.] Sents! 11/1   Georgia [R] Sents  21  Servant          WV     WV? WV? 22/98  Mary [M] Sentz    31? Sister (nun)     WV? WV? WV? Came from Germany as a young boy and was one of seven sons. c.  Casper [R.]? Sents? (  -  )  My Dad's Uncle Casper, according to my Mom! was married... to Clarissa Belle Leathers, and had some kids. c.  John Franklin Sents  (May 7, 1867 - 1921 Oriole, PA) Limestone Cem. m.  Emma G. Grier  (1872 - 1934 Oriole, PA) Limestone Cem. Jamestown/Oriole, PA  - Vestal, NY Vestal Hills Me. CPO (Machinist Mate) USN, Auto mechanic, race car builder/driver. Oriole, PA    - Vestal, NY Vestal Hills Me. 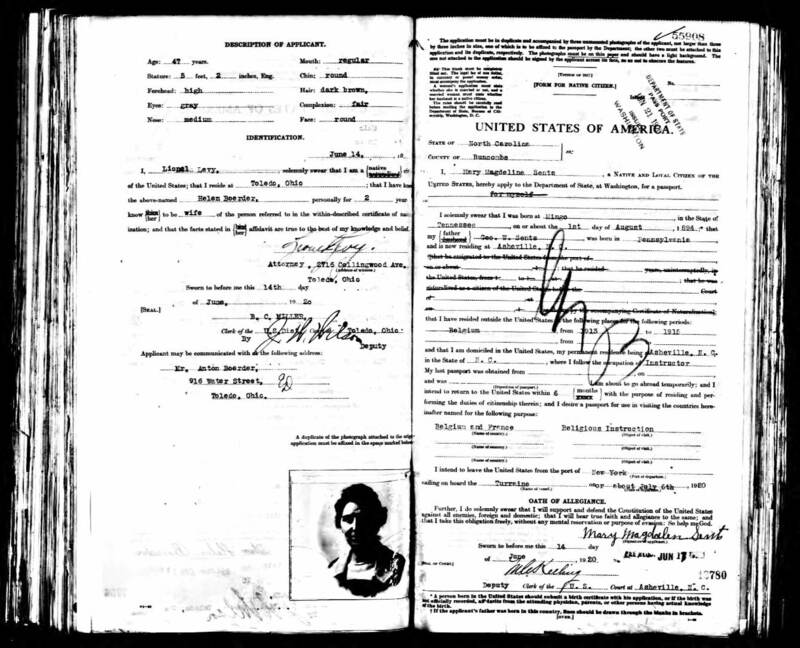 c.  Elizabeth Erma Sents  (1909 - 1940 ) Died in stove fire!